Suri and Katie visited LACMA - Los Angeles County Museum of Art on Friday, 27. Suri is wearing Seersucker Illyana Pink Dress by Ralph Lauren Children. Suri shows off her sweet side as her mom takes her to buy cupcakes at Crumbs Bakery in Beverly Hills on Sunday, 22. Suri is wearing one of her Princess Dresses from Disney Trip. 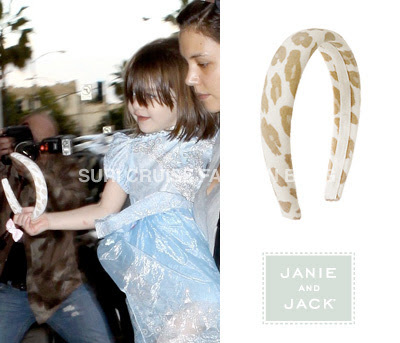 In this picture Suri is holding Leopard Print Headband from Embellished Elegance Line by Janie and Jack. Suri, Katie and The Beckham Boys were spotted arriving at The Children’s Art Studio in Santa Monica on Sunday, 22. Suri is wearing Striped Ruffle Cardigan by Juicy Couture. her look is completed with Bella Ballet Flat in Candy Red by Nordstrom, which she firt wore on November 20th. Suri and Katie went to the Alvin Ailey Dance Theater at the Disney Concert Hall on Friday, 20. Suri is wearing Cotton Pintuck Dress by Ralph Lauren Children. i haven't see this one before! 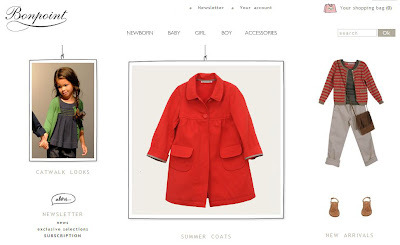 it's a very cute video of Suri & Katie shopping at Bonpoint last summer. Thanks to Anonymous for this link! Suri & Katie were seen headed into a dance studio in LA on Wenesday, 18. It looks like Suri is preparing to follow in her parents' entertaining footsteps. Suri wore these White Strappy Sandals from SS'07 Collection by Bonpoint, while playing around the parking lot on February 28th. Suri and Katie have a pizza lunch together in Beverly Hills, California on Sunday, 15. Suri, who turns 3 in about one month, hid her head in her mom’s shoulder for most of the time. 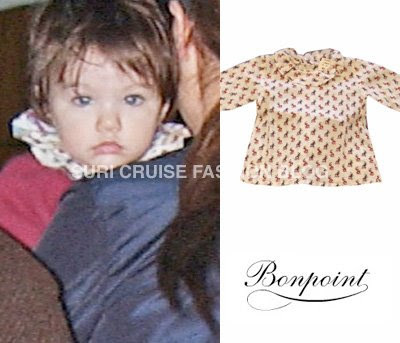 Suri wore this Ruffle Collar Printed Blouse by Bonpoint, while arriving at LAX airport on February 22nd, 2007. 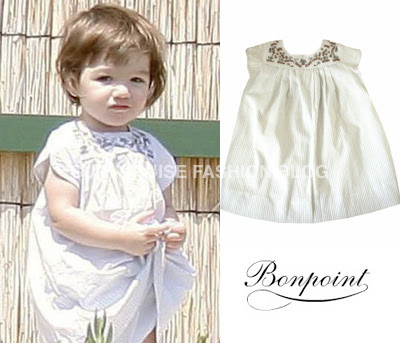 Suri is wore this Cotton Striped Tunic Dress with Embroidery by Bonpoint, while attending a wedding of Scientologists James Packer and Erica Baxter in Cannes of July 20th, 2007. 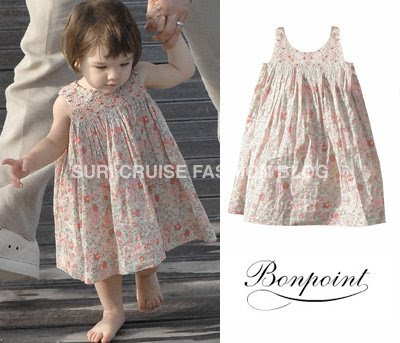 Suri wore this Smocked Flower Print Dress by Bonpoint, while enjoing an afternoon walk during her Summer Vacation in Cannes on July 20th, 2007. Suri wore this Blue Flower Pattern Dress by Bonpoint, while spending some quality time at the playground in Manhattan on August 5th, 2008. 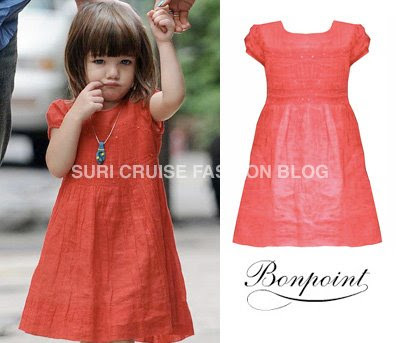 Suri wore this Sequined Bodice Red Dress by Bonpoint, while out for a walk around downtown Manhattan on August 15th, 2008. Suri wore this Grey Printed Dress by Bonpoint, while out & about in New York City on September 26th, 2008. I love this Tartan Rose Silk Dress by Janie and Jack for its amazing Rose Print and classic cut. 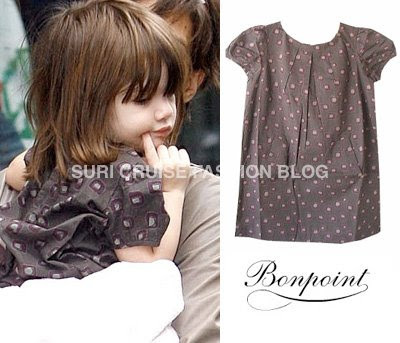 Suri wore this dress with Gris Suede Shoes by Bonpoint, for a city stroll in October 2008. Kate wore this dress with Red Patent Shoes & Pointelle White Tights by Janie and Jack, while attending a wedding in September 2008. I don't like Suri's hair and bare legs, Kate's shoes are a better match, so she wins it for me. Film commitments brought A-listers Katie Holmes and Angelina Jolie to NYC — but the working moms' most important project in Manhattan is coordinating a playdate between their toddlers! Katie loves entertaining and spoke to Angelina about having an at-home tea party with cupcakes for the girls," a friend of Katie's tells OK!. "It's something she has wanted to do for ages," adds another source close to the actress. "Because of security reasons, Katie can't have just any child over to her home. But with celebrity tots like Shiloh and Zahara, there's no problem." Plans for their "mini-meeting" began on Jan. 11 in L.A., when Katie and her husband, Tom Cruise, chatted with Angie and her partner, Brad Pitt, at a private Golden Globes afterparty thrown by CAA at the Sunset Tower Hotel. Of course Tom, 46, and Brad, 45, are hardly strangers. The two co-starred in the 1994 vampire flick, Interview With a Vampire, but lost touch over the years. "Since the film, their careers and social circles have become so different, they rarely see each other," explains the source. But the two men acted like old friends that night. "Both talked at length about their children," adds the source, "and they agreed to get their little girls together." There may be another reason for the playdate too. Katie desperately wants to introduce Suri to other children her age. While the toddler has adopted siblings Connor, 14, and Isabella, 16, to play with, the teens are much older. 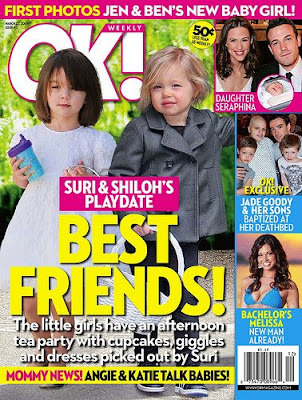 "Suri's a very shy young lady," a Cruise insider tells OK!. "Even when Tom or Katie have taken her to a park or beach and tried to introduce her to other kids for a little playtime, it hasn't worked. She's very clingy." "Katie told Angelina she just knew Suri and Shiloh are going to get along fantastically well," says the insider, "and Suri is already getting into the idea." Suri and her parents arrive at Narita International Airport in Tokyo, Japan on Sunday, 8. Tom is in Japan to promote Valkyrie, which will premiere on March 11th. Following their arrival at Narita, the TomKat and Suri were then escorted outside to an awaiting helicopter, flying off to a nearby location. Tom is carrying a White Scallop Placket Coat by Best & Co. for Suri, which she wore back in December'08. 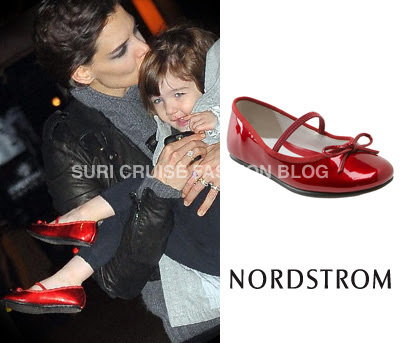 Suri is wearing Salina Safari Patent-Leather Ballet Flats by Crewcuts. Suri is wearing Red Silk Dress by Holmes&Yang. Suri was seen in this dress arriving to hotel in Rio on January 30th. 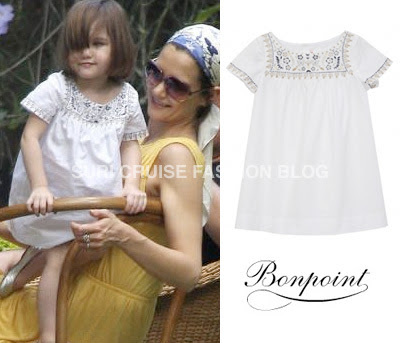 Now you can purchase online Carla Dress in White, which Suri wore on her trip in Brazil, February'09. Suri wore this Striped Cotton Sweater Dress by Juicy Couture back in December'08. Dress is available online in Pink/Green stripes at Neiman Marcus. 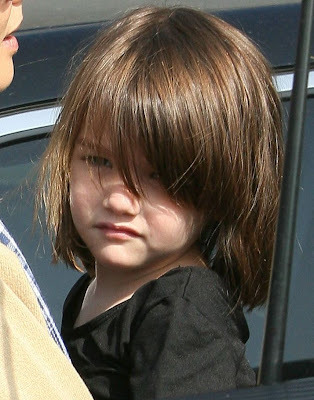 Suri & Katie spotted in LA on Monday, 2.
maybe Suri had a ballet class? looks like Suri is wearing Toddler Deluxe Leather Ballet Shoes by Danshuz. 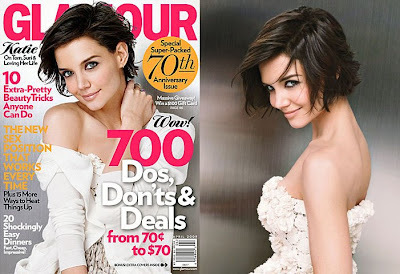 Katie Holmes talks about daughter Suri to Glamour! GLAMOUR: Still, you’ve come into your own. In a recent interview you said, “I’m a bit wiser.” How? KH: Well, becoming a mother has been the most amazing experience—in an instant you become strong. You have to be a little bit wiser; it’s the most important job in the world. GLAMOUR: Did it scare you at all? The responsibility? KH: Of course. During the first couple of days [with Suri], we would just sleep right next to her to make sure she was breathing. And I was constantly learning on the job, but Tom was very helpful and supportive. KH: Some of the stuff [people said] was such absolutely horrible things to say about a child. It was so uncalled for and so disgusting. Enough is enough. GLAMOUR: Did Tom ever say, “Don’t worry about it” [since he was more used to media scrutiny]? GLAMOUR: As you know, the rumor right now is that you are pregnant! KH: Well, I’m not pregnant right now. GLAMOUR: The people who print stuff like that…if you could say something to them, what would it be? GLAMOUR: And what would they see? What’s a day in the life of Katie, Tom and Suri? KH: We’re all together. We like to be together, so we use the house for our [business] meetings. [We] play Yahtzee, board games, Scrabble. We grill; have pool parties. We play “The Three Little Pigs” and Suri is the Big Bad Wolf. [Tom] reads storybooks to Suri, and we all laugh. When a good song comes on, he’ll break out in a dance. We’ll watch movies in bed—recently Madagascar and Cinderella, for Suri. We really have a good time. GLAMOUR: And Suri, does she know that she has famous parents? GLAMOUR: Who is she more like? KH: You know, I see glimpses of Tom and me in her. She’s really such a special girl—strong and funny. She’s her own person. She has a great sense of humor. GLAMOUR: Now, moving from love to work: Tell me about the experience of doing a play every night on Broadway. KH: I always wanted to do theater. And that experience was better than I could have ever imagined. It was fascinating because your performance changes every night. You’re learning different things about the play and your character. It was great to have Suri come—she couldn’t come every night, but she came a lot during the week. To have my family there was icing on the cake. GLAMOUR: And what’s this about a clothing line? KH: My friend Jeanne Yang and I have been working together. She’s got twin girls about six years old, and we both grew up with mothers who sewed. 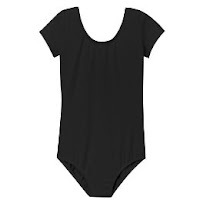 We started about a year ago, sketching different things, trying to find comfortable clothing for our daughters that is also pretty and cute. 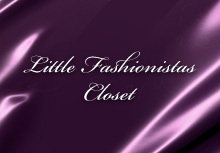 We just started, and we’ve played around with doing things for women as well. read here the full story by Sheila Weller. Suri and Katie had brunch together at Le Pain Quotidien in West Hollywood on Sunday, 1. 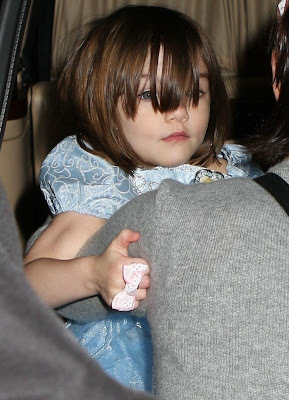 Suri wore a typical beautiful dress with her famous Silver Ballet Flats by Bonpoint, but this time she had a tiara in her hand, reminding us of her recent trip to the Magic Kingdom. Suri gets barefoot as she and Katie exit the art class with about five other students in it, on Saturday 28. Suri started running and dancing as soon as she exited her two hour art class, she even lost a shoe in the process but that didn’t stop her from playing around the parking lot. 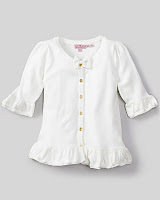 Suri is wearing White Smocked Cardigan by Juicy Couture. She wore the Blue version of this cardigan back in October'08. Suri wore these White Strappy Sandals from SS'07 Collection by Bonpoint.